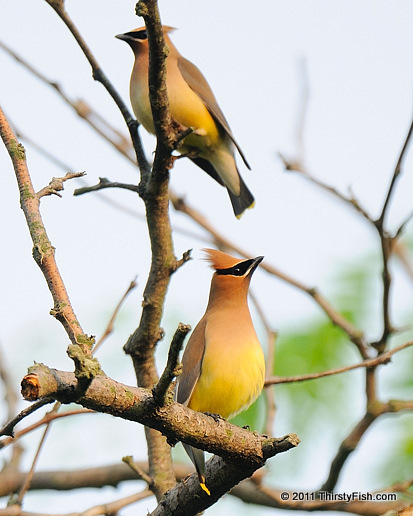 The Cedar Waxwing is a silky, pale yellow perching bird that breeds in North America. Although not seen in this photography, the Waxwing gets its name form the "sealing wax" looking vibrant red tips at the end of its secondary wings. The tail-tip is typically yellow (or orange). Male and female cedar waxwings look alike. They primarily eat berries and other fruit. It is believed that Waxwings, upon consuming fruits that have fermented on the vine, become intoxicated and as a result fly irregularly and even get into accidents, running into cars, buildings and glass windows. They are vulnerable to alcohol poisoning, and may die as a consequence. If the wine drinker has a deep gentleness in him, he will show that, when drunk. and since most people do, wine is forbidden to everyone.